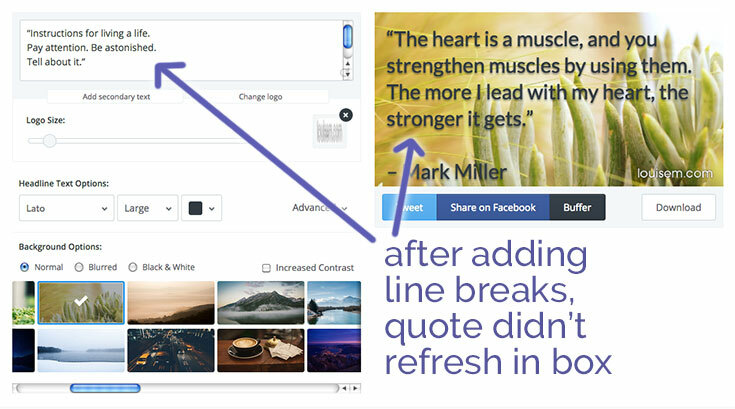 Want to make super fast picture quotes? Now you can, with Pablo from BufferApp. Of course, there’s always a tradeoff between speed and options. Pablo doesn’t offer a lot of options, but it’s definitely fast – and it’s free! What’s not to love? Once you find (or even upload) a background image you like, and choose a font, you can actually crank out a dozen images in about 2 minutes! Refresh the quote (or type in any text of your own), download, and repeat. See how it works (and how fast it is) in this video. Let me preface this section by saying: I’m picky. I’m a graphic designer, and I get paid to be fastidious about visuals. You, on the other hand, are a time-pressed entrepreneur, who’s struggling to get on board with visual marketing. Pablo will help you! I truly recommend you give it a run. Nonetheless, here are the things that bugged me. Adding line breaks to make the text look better one time meant the next quote didn’t appear in the text box when I refreshed. So I couldn’t add line breaks to any more of Pablo’s quotes during that session. Most people wouldn’t care – but sloppy type design is a deal-breaker for me. Maybe this was just an issue with my Mac OS? Pablo only let me set line breaks on the first Pablo-generated quote in a session. Another slight oddity – only 33 backgrounds are available at a time. If you come back to Pablo later and want to use a background you saw previously, it mightn’t be there. You could refresh the page and look again until you find it. Text colors are limited to black, white, red, and blue. Medium to dark backgrounds with white text work best. Black text also has a black shadow – it should have a light glow, to stand out more on your background. Limited to one size and shape – horizontal only. You can’t fade back your logo to make a watermark. I suppose my main caveat about Pablo is that you’d be hard-pressed to come up with top-quality, branded images. Of course, the photo selection is limited and somewhat generic. It’s free, after all. But the photos may not speak to your brand image. While I applaud the ability to upload your logo, a logo alone doesn’t make a brand. You can upload your own backgrounds, a nice touch. Finding the right backgrounds will add time, of course. I foresee a lot of images being cranked out where the words and photo have little to no relationship to each other. I’d rather see more abstract backgrounds, as on ShareAsImage. 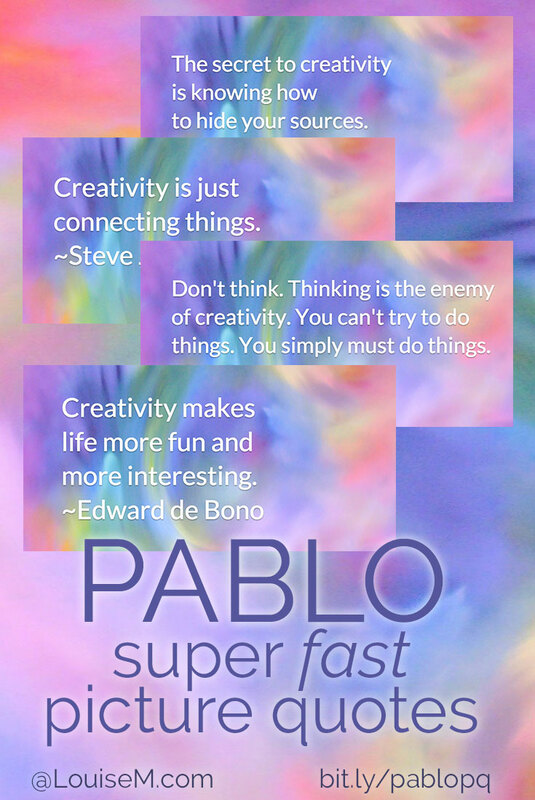 I had already collected some backgrounds, and compiled a sheet of creativity quotes, so I decided to see how Pablo would work for me. I created 55 images, with 7 different backgrounds and my logo, in 45 minutes. Fast! Check out my creations on my Twitter account. (Note: you won’t find these backgrounds in Pablo). So Pablo worked fine for me – but for you, it may be a godsend. 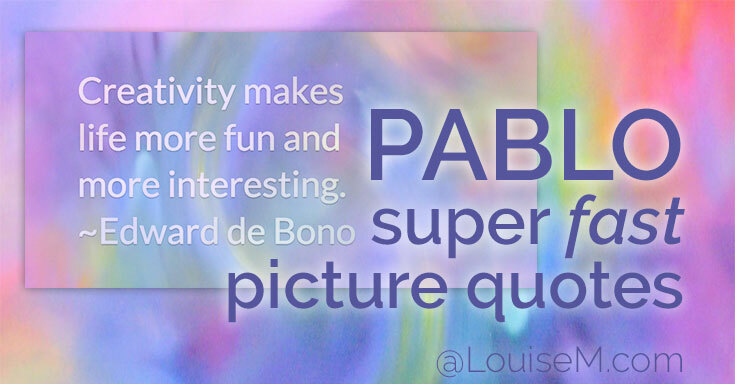 If you want to crank out fast picture quotes, Pablo is a great tool. To go beyond picture quotes, grab my FREE report on The Best Design Apps below! Nice post. I like the line “My First Date with Pablo”. Pablo I think, I have to check it out. After reading so much about you. Check it out, hope you like it Pooja!